Time-tested Sino-Pakistani relations are far more than the China-Pakistan Economic Corridor (CPEC), and no one can destroy the CPEC or the wider ties between the two countries, according to Makhdoom Babar, president and editor-in-chief of the Daily Mail of Pakistan. Babar mentioned the recent meeting in Beijing (Sept. 19) between Chinese President Xi Jinping and Pakistan's Chief of Army Staff Qamar Javed Bajwa, saying it demonstrated the commitment at top level uniting the two nations. During an interview in Islamabad, the capital of Pakistan, he said the media should tell the people more about what benefits the Belt and Road Initiative (BRI) has brought for individuals, and not just for governments. Proposed by China in 2013, the BRI refers to building a Silk Road Economic Belt and 21st Century Maritime Silk Road, aiming to build a trade and infrastructure network connecting Asia with Europe and Africa along time-honored routes. Babar spoke highly of the changes brought by the BRI and described it as a "game changer" for his country. Holding up a newspaper, he explained: "Before, we bought the newsprint from Sweden; now, we can get it from China at a lower cost. Furthermore, in this room, you can see all the lights are from China and they are cutting my electricity bill. Before CPEC, we used to have very low-quality lights from small Chinese firms; now, big companies are bringing us these things." Displaying his Huawei phone, he said the Chinese brand had become the biggest market share in Pakistan, followed by Samsung and iPhone. As more and more Chinese people visit the countries along the Belt and Road, and do jobs and start businesses there, it is in urgent need for these people to know each other and to learn the cultural values of other countries, the newspaper executive said. "Movies and dramas should also be utilized to bring people closer to each other under the BRI," he stressed, adding that he has an idea of starting a BRI television network covering all BRI countries, with Chinese movies and dramas shown in the languages of these countries. More people-to-people contacts could be promoted by a high-profile art show, thus increasing relations at the grassroots level, he said. Babar called on like-minded media from the countries along the Belt and Road to develop a syndicate to share and publish or broadcast "team stories." In a bid to promote cultural exchanges between China and Pakistan, Babar said the media should "spread stories of those Chinese who have learned the Pakistani language, and those Pakistanis who are in China learning Chinese and are keen to learn more about China." He went to emphasize: "My passion for China originates from the built-in love for China. Now, young Pakistanis desire to go to China for further education, because parents like me think that their children would be safe in China." 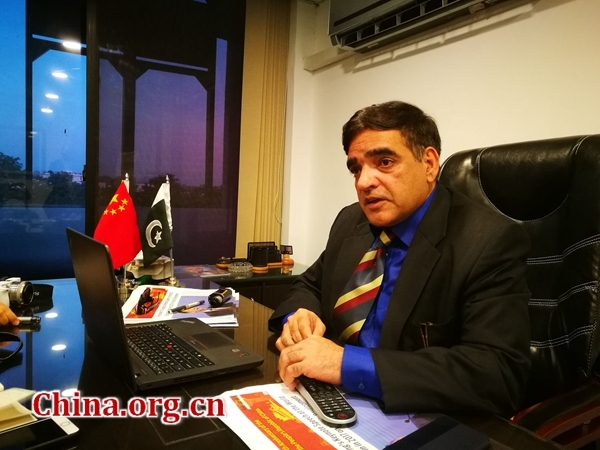 Babar is also the chairman of Pak-China Media Friendship Association, a joint media platform of Pakistani and Chinese journalists founded in 2005 to promote bilateral ties through joint media endeavors. He is looking forward to more cooperation with Chinese media organizations in the future, bringing the all-weather friendship between the two countries to a new height. Makhdoom Babar, president and editor-in-chief of the Daily Mail of Pakistan, called on like-minded media from the countries along the Belt and Road to develop a syndicate to achieve expanded people-to-people contacts.